Ever since I started this blog, and made brief mention of the fact that I volunteered at Odiyan, I have received numerous inquiries about it. Often times it takes me much too long to reply to these, in large part due to the subject requiring a more in-depth response. So I decided to post a "frequently asked questions" about Odiyan which will hopefully make it easier for those interested to get the information they want, while giving me a little fewer writing assignments in the future. Not that I don't like writing about Odiyan, but I don't always have the time that I feel these types of inquiries deserve. If you do not find your question answered, feel free to post a comment here and I will update this post as new information is requested. For the official Odiyan website please go to www.odiyan.org, or you can also find them on myspace here. Please be advised that some information on the Odiyan website is not up to date. Did you volunteer at Odiyan? Yes, I did spend six months at Odiyan. I actually stayed from January to July of 2006. It was quite the experience. I don't know whether you have contacted them yet, but they can certainly send you a basic info packet about the whole thing. At this time, they are still accepting volunteers. How many people live and work at Odiyan? This tends to vary, but on average it tends to be around fifty people. This number is primarily comprised of volunteers. Are there people who live and study at Odiyan full-time? Yes. There are a number of residents who have been there since the beginning of Odiyan, which means that they have been there for over thirty years. So you have your long term residents, and then you have your younger residents who have been there only a few years at most, and often times less than a year. How do you get into Odiyan? It is mostly closed to everyone outside of Odiyan, with a few exceptions. Every once in a while they will invite groups from other Nyingma Organizations, such as those working on the Yeshe De project in Berkeley. Odiyan is not, however, open to the public. There is no indication of this policy changing, so the only way to get in is to become a volunteer. Why is it closed to visitors? That is a subject of some debate I suppose. Tarthang Tulku, the founder of Odiyan, has his reasons. The Senior Sangha, the long term residents, sometimes have more strict views of not wanting outsiders to somehow negatively impact the community. There does not seem to be a consensus on this matter, however. In either case, they are very specific in who they choose to accept as volunteers. Is Odiyan still under construction? Odiyan has been under construction since it's beginning before 1970. Since then they have built the main temple and the rim structure around it, the stupa, Vajra temple, some other buildings, and now Cintamani temple. They will also be building a complex around what was know as "the German Bell." Though the new name for that is, if I recall correctly, Viratsana Gardens (sp?). The state of construction at Odiyan is essentially indefinite. There will undoubtedly always be additional projects going on. What is the daily routine there? Being at Odiyan means you learn how to work. Really. So be prepared for that. Breakfast starts at 6 am, and work begins at 7 am. You take one break around 9:30 am, and then go to lunch at noon, which lasts one hour. So you're back at work at 1 pm. Your next break comes around 3 or 4 pm, I can't quite remember which. The work day ends at 7 pm, and dinner is served at 8 pm. You eat, and you generally go right to bed. This goes on for 6.5 days a week, unless you voluntarily choose to help with additional tasks on Sunday. 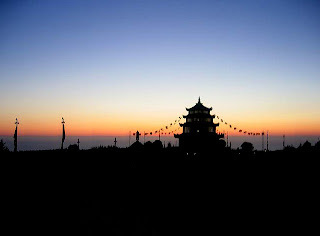 There are a select few holidays where you don't have to work, such as the Tibetan New Year's celebration in the Spring. However, once you become accustomed to this routine, it becomes second nature and comes much easier than you might expect. My experience there, as many people's, was somewhat mixed. It was not an easy time to be sure, but a very fruitful one nonetheless. When it comes down to it, it's a lot of work but that isn't the difficult part at all. The hardest part of the experience is your self, or your mind. That may sound strange, and I don't know how familiar you are with Buddhism, but I believe you'll find mostly anyone who's been there telling you the same thing. In other words, whatever physical challenges you might face are much easier to overcome than the challenge of "getting over yourself." Sorry if this all sounds too cryptic, but Odiyan is not merely a physical experience. It is very much a mental, and even a spiritual experience. The result of how good or bad of one it is, depends entirely on how open you will be to receive what you are presented with. If you can maintain a state of non-judgment throughout the whole term, you will have a wonderful time. Yet that is hard for most, and it was for me. Eventually the mind wants to cut in, and remind you of what you may or may not like, and begins to judge what lies before you. That's when things get tough. For me, the first three months were great, filled with wonder and learning. They went by all too quickly it seemed. Then, somewhere in the middle things changed. I grew less satisfied, and found the last three months at Odiyan to be rather challenging. They seemed to take a long time, and I was looking forward to leaving again. As far as I understand it, this is not atypical, but it all depends on you in the end. What is the purpose of Odiyan? The multiple purposes of Odiyan are as follows. It is used as a repository for Tibetan texts and art, with endeavors to continually archive those materials. It is also intended as a place for its residents to practice the spirit of Buddhism in action through the Skillful Means method. The less tangible purpose of Odiyan is to generate positive energy for all of the world. This is of course debatable depending on your position, but the entire site is designed as a life-size mandala. The completion of Cintamani temple is the final project which will make the mandala whole and thus activate it. This will amplify the generation of positive energy therein. Of course, I am certain that things get a little more complex after that, though that is probably beyond my understanding, and beyond the understanding of most. So is it really awesome, or just too good to be true? All in all, it sounds like a great place. Though whether you will find it as such depends entirely on you. Even after thirty years of life in this community, the people who run the place are still just that: people. And that is often forgotten I think. In my experience, there is a rift between the older residents and the newer residents. And being at Odiyan can become a difficult thing when you cannot establish a support structure. Yet those difficulties arise not as a result of anything that has to do with the work, the conditions, or your physical state for the most part. Disclaimer: These statements are my own, and I am not officially affiliated with Odiyan or any of the Nyingma organizations. Information presented here may not reflect the views or policies of Odiyan or the Nyingma organizations.